Between 1889 and 1898 the only factory licensed to produce picric acid as an explosive was the one at Reddish and for most of that time its capacity was under-utilised.The Boer War changed all that. The rising demand for shell fillings saw a rapid increase in the number of licensed factories. Three were licensed in 1898, including the Low Moor Chemical Company and Samson Breaks & Son.Two more followed in 1899, one of which was Read Holliday at Huddersfield.The peak year was 1901-1902 when 12 factories were licensed to make the explosive, of which seven were in Yorkshire. By this time, reported the Home Office inspectorate, ‘this material is now manufactured very little for non- explosive purposes’. The increase in the volume of production led to increasing concern about the safety record of picric acid. Further doubts about the assumption that ‘picric acid by itself, in whatever quantity, will burn without explosion’ were raised after an explosion at St Helen’s in 1899.Although this did not involve picric acid,the same assumption had been made about the substance which was involved, chlorate of potash, only to be disproved when large quantities of it exploded during a factory fire. As a result of this incident, all new licenses granted for picric acid producers restricted the amount of acid stored in any one building to five tons.When several thousand pounds of picric acid exploded at the Read Holliday works in Huddersfield in May 1900, the report made by the inspector of explosives concluded that picric acid was explosive in large quantities; that accidents had been few in the past only because of the limited scale of manufacturing, the risks of which had escalated as the volume of production increased; and that picric acid should be treated in future as any other explosive. 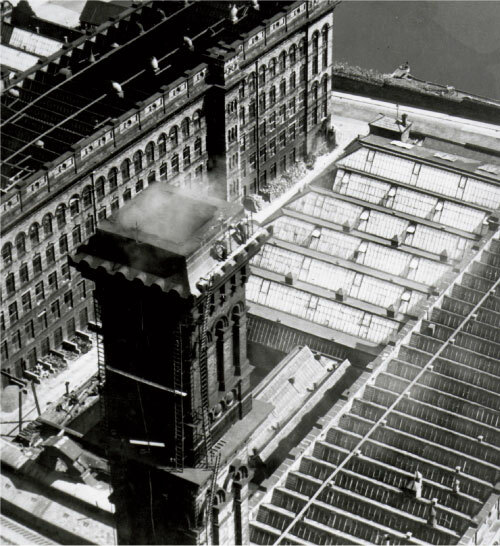 In the meantime, so that War Office contracts should not be disrupted, existing picric acid factories were instructed to fit fire-extinguishing apparatus in all buildings where dried picric acid was stored and the quantity of picric acid permitted in a single building was reduced to 2,000 pounds. Picric acid was finally made subject to all the provisions of the Explosives Act, except when it was mixed with not less than half its weight of moisture in every part of the process.These actions appeared to deal satisfactorily with the problem.There was only one slight incident concerning picric acid in the years before 1914. This may also have had something to do with the fact that after the Boer War the level of production declined, with the number of picric acid works falling to eight by 1908. But this excellent safety record, coupled with the fact that several trivial fires went unreported, created complacency, encouraging many to believe that picric acid would not explode immediately upon ignition and that a fire could be extinguished with water in its early stages. The Samson Breaks workforce early 20th century. The War Office contracts gained during the Boer War gave S Breaks & Son a welcome boost, although the business remained small. Its net assets at the end of 1902 were estimated to be £4,447, half of which was cash in the bank. In 1906 sales were £4,469 with a trading profit of £380. By then the market for natural dyes such as indigo and logwood had fallen away sharply and Breaks soon gave up this part of the business as it had become unprofitable. Instead the business made sodium sulphate or Glauber salts which was used to add bulk to fabrics for the textile industry.The business also began to merchant other intermediates to the textile trade which it bought in from elsewhere. There was little further development of the site itself. One addition was a small dining room for workmen where they could eat the lunch they brought with them. The business was run by Samson himself, his brother Amos, and Samson’s only son, John. Samson began to take less of an interest in the business in the early years of the new century and left its direction largely in the hands of Amos. Samson was thinking about retirement and how best to realise the value of the business he had built up. His son John appears to have been a disappointment to his father and showed little aptitude for the business.Amos Breaks had no wish to take over the business and wanted only to continue working in the firm until his own retirement. Horse and cart in yard -Wyke Lane Works early 20th century. 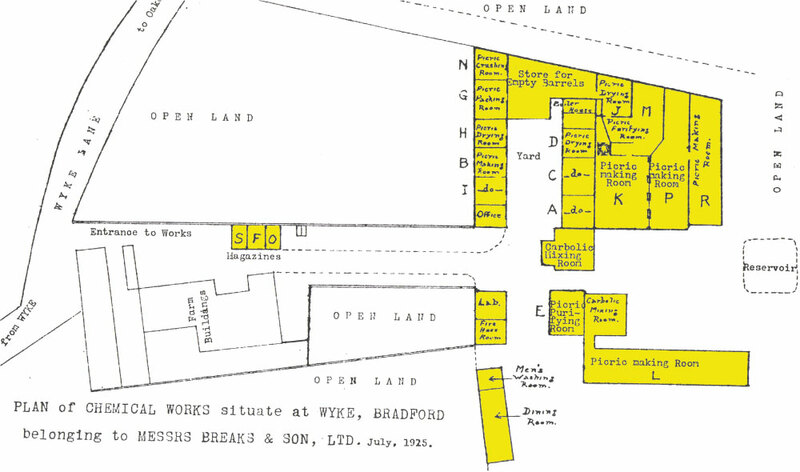 Textile industry in Bradford - late 19th century. Augustus Henry Marks was working in the early 1900s as a commercial traveller and was a frequent visitor to the Wyke Lane works. For many years he worked for William Blythe and Co Ltd, of Holland Bank Chemical Works at Church in Lancashire, although he lived at Crumpsall, near Manchester. Blythe was a similar business to Breaks, with a background in the dyestuff industry. Blythe also made picric acid and may well have provided Breaks with supplies from time to time to supplement the latter’s own production.The two largest dye manufacturers in the country were Read Holliday in Huddersfield and Ivan Levinstein in Manchester. Levinstein had two factories, one opened in Blackley in 1864, with a second following at Crumpsall in 1887 as the marketing of intermediates grew and the range of colours widened. Records show that the Wyke Lane business dealt with Levinstein, occasionally purchasing picric acid from the Manchester firm, presumably again to supplement Breaks’s production. Given the beginnings of Breaks’s own merchanting business in the early 1900s, the firm possibly also obtained supplies of dyestuff intermediates from Levinstein. In such a small business Marks would have dealt directly with either Samson or Amos Breaks. He had ambitions to be more than a travelling salesman and over several visits to Wyke Lane Samson Breaks will have planted in his mind the possibility of taking an interest in S Breaks & Son. Balance Sheet @ 31 December 1906. The basis of the transaction which followed is unclear. But on 9 March 1906 the firm was incorporated as S Breaks & Son Ltd to ‘carry on the business of manufacturers of and dealers in picric and other acids, chemicals, explosives and drysalteries of every kind’. Samson Breaks sold only the plant on the site to the new company.The price was £1,000 and the parties to the sale agreement were Samson Breaks, the new company and Marks. 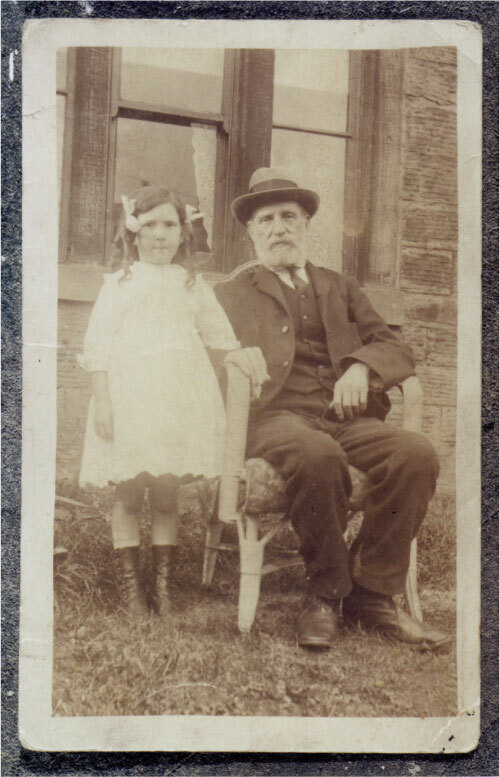 Amos Breaks with grand daughter 1914. Break, now described as a retired chemical manufacturer, and Marks, still a commercial traveller, were also the first two directors, although Marks remained in Crumpsall for at least another year. John Breaks was appointed company secretary.The issued capital of the new company was £2,571 in £1 ordinary shares and both directors were allotted 500 shares each. The remaining shares were taken up by a further 24 shareholders. 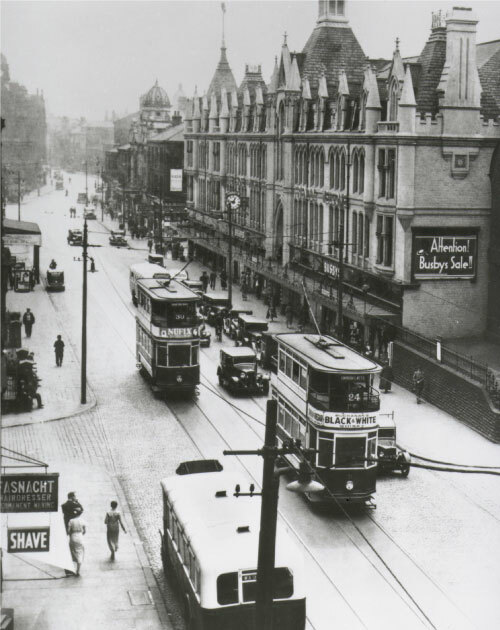 Some of these were local businessmen, presumably were customers of Breaks, such as William Hare, with a dyeing business at nearby Apperley Bridge, and Benjamin Threapleton, whose dyeing and finishing business was at Park Mills, Wellington Street in Leeds. 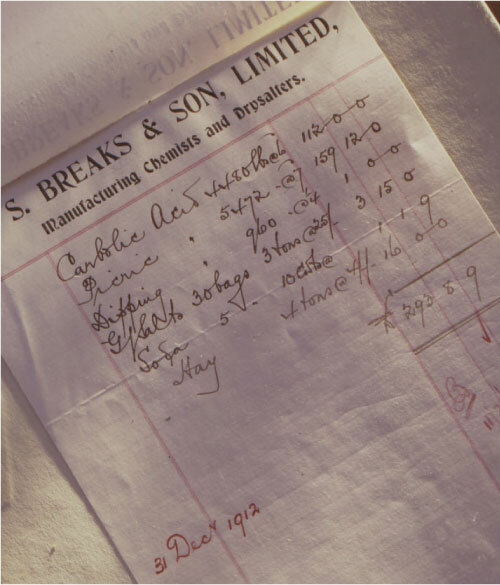 Other members of the Breaks family, Amos, John and Albert (who was an assistant at the works), took shares. But most of the others who subscribed for shares were relatives of Marks and his wife Margaret. 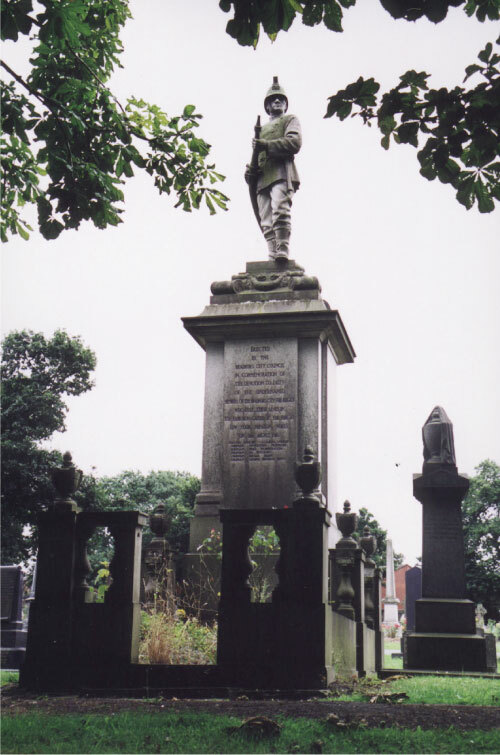 These included Marks’s sisters, Julia Hood, who lived in Bradford, and Emma Bagshaw, in Leeds, his nephews and niece in the Bagshaw family, and his brothers- and sister-in-law from the Rees family. If Marks was unable at the time to raise the necessary funds to purchase as many shares as he would have wanted, then persuading his relatives to do so was the next best thing. As a result, Marks and his relatives had a stake of 35% in the business at the end of 1906. Samson Breaks remained long enough on the board only to give Marks sufficient instruction in the running of the new business. He resigned in March 1907, selling all his shares, by which time Marks had left his previous job, moved to Rosebank at Lightcliffe near Halifax, and become managing director of the business. John Breaks experienced only a brief period as director before being removed from office. 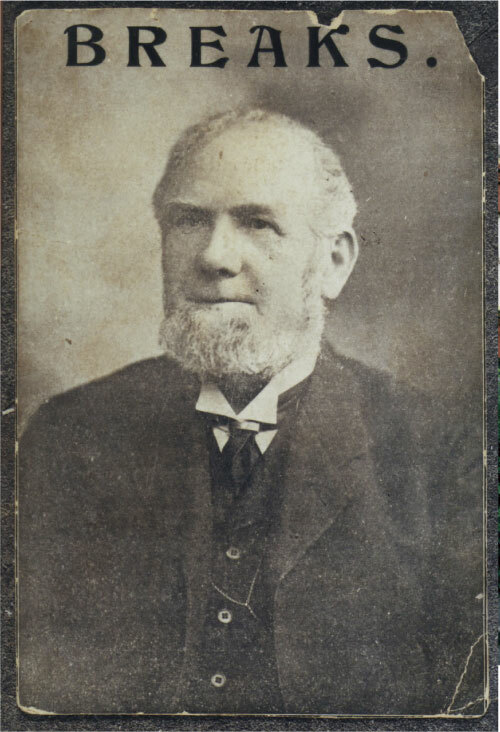 His uncle, Amos, on the other hand, was appointed to the board and remained a director until his retirement in 1912.William Hare also became a director and his experience was obviously valued since he served the company until his death in about 1920. With his retirement from the board, Samson Breaks was free to seek other interests. After the 1907 Bradford municipal elections the victorious Conservative candidate for the North Bierley ward was elevated to the aldermanic bench. Samson Breaks was selected to stand for the Conservatives in the ensuing by-election against the previously defeated candidate from the Workers’ Municipal Federation. Described as a level-headed businessman rather than a great orator, he won the seat with a majority of 172 votes. His opponent had hardly done himself any good, calling the voters ‘half-baked duffers’ for his previous defeat. Breaks served for four years on the council at the end of which term the most that the Bradford Daily Argus, the main organ of the Conservative Party in Bradford at the time (the other main party, the Liberals, was supported by the Bradford Daily Telegraph), could find to say about him was that he had been a diligent attender instrumental in securing baths for Wyke. He stood for re-election but the Labour movement was much stronger in 1911 than it had been in 1907 and Breaks lost the seat by 160 votes. Home of A H Marks - Crumpsall Manchester. Samuel Breaks election address 1907. He saw no need to remain any longer in Bradford. 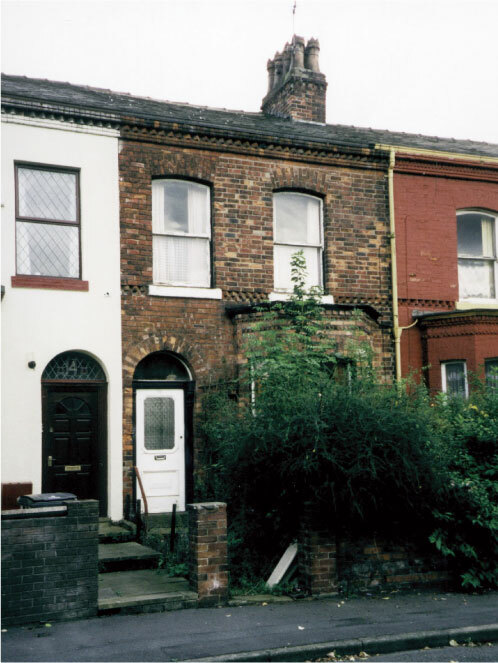 In March 1911 he had already sold the land and buildings at Wyke Lane to the company for £2,000, advancing it £1,500 at interest of five per cent per annum over five years towards the purchase.Then in 1913 he sold his house, Greenmount, in Wyke to Marks for £1,500, lending him £1,000 towards the purchase, repaid in 1919, and moved to Morecambe where he spent the rest of his life. The final links between the company and the Breaks family were broken in 1912 when Amos Breaks, who retired from the board, and Albert Breaks both sold their shares. Amos, like his brother, also retired to Morecambe where he died in 1915. This effectively left Augustus Henry Marks in sole control of the business. From 1912 he became the only full-time director of the company and after the death of William Hare he was its sole director. Although he and his wife Margaret held only 24 per cent of the company’s shares, the sale of Amos and Albert Breaks’s shares to Marks and his relatives gave them as a group overall control of the business with nearly 53 per cent of the shares. 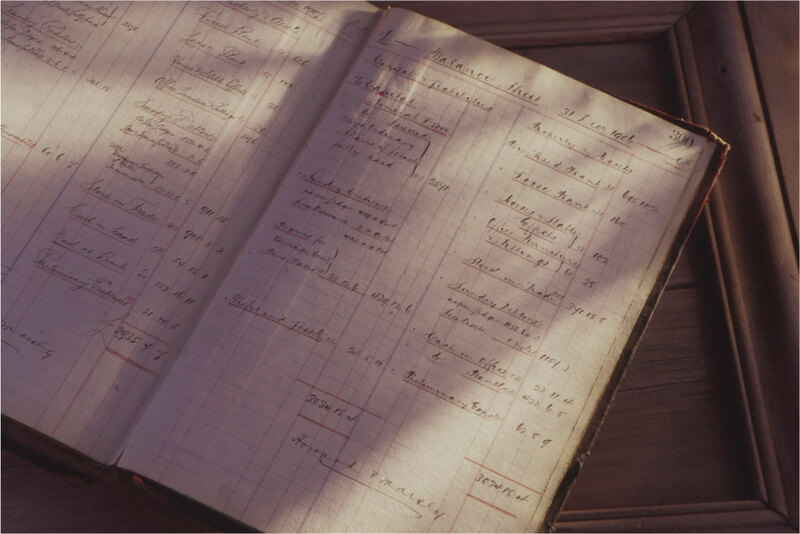 In the years between 1906 and the First World War the company under its new management made steady progress.Turnover grew from £3,800 in 1907 to a pre-war peak of £12,800 in 1912.Trading profits, which averaged only £414 between 1907 and 1910, rose to an average of £1,241 for each year between 1911 and 1913. Net profits were minimal before 1911 and in fact had been insufficient to pay a dividend in 1906 and 1907. A dividend of two and a half per cent was paid to the shareholders in 1908, but the norm before the war was five per cent, with the exception of 1912, when a one-off payment of 17.5 per cent was made. If War Office orders for picric acid declined after the end of the Boer War, and there was little demand from the textile trade, then other markets must have been found. One lay overseas and there is evidence that the firm was exporting picric acid abroad before the war, particularly to Austria. At the same time the firm was building up its merchanting side. Surviving stock lists for 1912 and 1913 show the firm was supplying local industry with, among other items, Glauber and Epsom salts, and dipping acid (for cleaning metal before electro-plating it). Day Ledger 18 August 1914 showing sale of five casks of Picric Acid to Levinstein Limited Blackley. A H Marks Stock List 31 December 1912 (showing hay for horses). By the time the First World War was declared in the summer of 1914, picric acid had become the standard filling for shells. Before the war the 10 factories licensed to make it were producing only 35 tons a month. By the end of 1916 one company alone, the Low Moor Chemical Company, was making between 150 and 200 tons of picric acid each week. It is not surprising that the escalation in demand for picric acid during the war saw staggering growth at theWyke Lane works.The turnover of S Breaks & Son rose more than 53 times in four years from slightly more than £8,000 to nearly £425,000.While this no doubt reflected the increasing market price of the acid before government price controls were imposed at the end of 1916, the volume of stock held at the end of each year also rose over the same period by nearly 39 times. 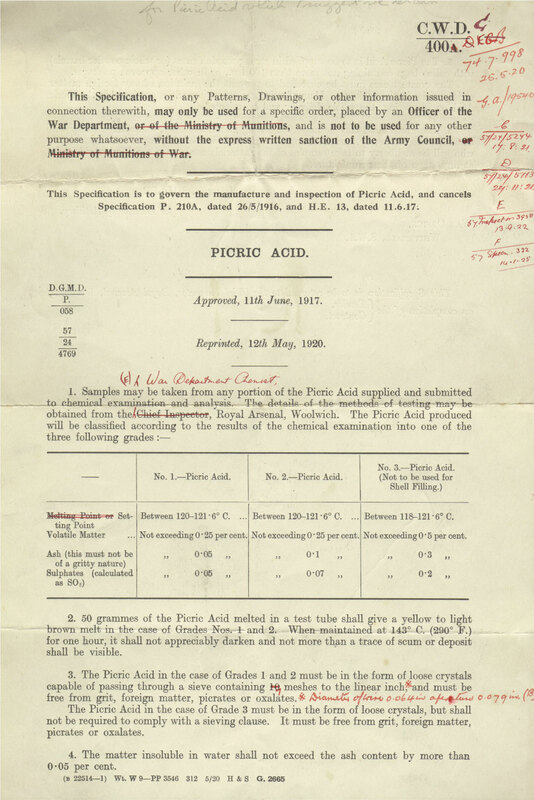 Although production of picric acid in Britain never reached the same level as it did in France because of the change-over by the British from picric to amatol as the charge for shells, it was used by the Royal Navy throughout the war. Early on in the war demand did threaten to exhaust the supplies of the main raw material, phenol, from its usual source, the coal-tar distilleries. As a result, processes were quickly established for the synthetic production of phenol from benzene. Much greater quantities of sulphuric and nitric acid were needed and production not only of these but other chemicals was greatly expanded as a result of the pressures of war.The considerable knowledge and experience acquired as production was expanded so rapidly in such a short space of time formed the basis for the post-war creation in Britain of an organic chemical industry on a previously unheard of scale. To keep pace with demand, there was a significant investment in plant and buildings at the Wyke Lane works for the first time in several years. Between 1914 and 1916 nearly £6,500 was spent on various building extensions on the site. Much more space was given over to the manufacture of the acid.The buildings were made of brick with slate roofs.As a safeguard against explosions, buildings where the dry processes took place were lined with wooden matchboarding and had concrete floors covered with asphalt. A small laboratory was built in which the company conducted its own sampling and testing of picric acid although independent acceptance tests had to be carried out by staff at Leeds University working for the War Office before any acid could be released from the site. A wash room and dining room were provided for the men. Because the war had created a shortage of male labour, women were working on the site and a mess room was built for them at the entrance to the site. More fixed plant was acquired, notably a new concentration plant and new crushing machine in 1916 at a cost of £1,260. Motor lorries were purchased for the first time, although horses were still stabled at the works.The site itself was extended in March 1916 when more land, part of Upper Ing and the Mowing Field, totalling some two acres, was purchased for £600. There was also an investment in personnel. By the end of the war the site was employing four chemists, Bowen, Stanhope, Majerus and Anderson. Majerus was probably Victor Hoffman Majerus, the son of the manager of the Low Moor Chemical Works, who came to Breaks after the explosion which devastated Low Moor in 1916. The rapid expansion of the business encouraged Marks to consider further plans for the company. The firm had been making quite considerable wartime profits (£16,674 in 1915, £42,018 in 1916) which represented a percentage increase of two and half times over the average trading profits made before 1914.A dividend of 12.5 per cent was made in 1914, but in 1915 and 1916 this rose to 100 per cent and even in 1917 a dividend of 50 per cent was paid.While some of these profits were earmarked for excess profits duty and further investment at Wyke Lane, part would also have been available for expansion elsewhere. 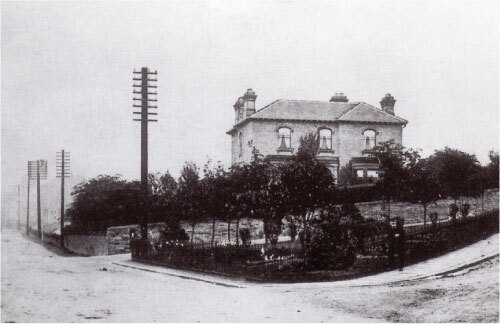 He used his association with the Blythe family, his previous employers, to progress his plans, persuading Frederick Blythe, who ran the Blythe chemical works in Northwood in Middlesex, to join him in buying an existing chemical works in Roberttown, Liversedge, only a few miles from the Wyke Lane works, in 1915. This was the ‘new venture’ referred to by another member of the family, Lance, managing director of William Blythe & Co Ltd, who wrote to wish Marks well when he finally resigned on 1 July 1915. Lance Blythe also told Marks that the directors wished to convey to him ‘their sincere thanks for many years of faithful service and their high appreciation of your abilities’. The business acquired by Marks and Blythe was the Roberttown Chemical Works in Old Lane and Child Lane, Liversedge. It covered a large site of nearly 12,000 square yards with plenty of potential for improvement.The Roberttown works would have enabled both men to expand the production of picric acid and take further advantage of lucrative government contracts. Perhaps in the longer term they were interested in manufacturing their own intermediates for the dye industry, whose fortunes were undergoing something of a revival in wartime, protected and encouraged by the government as it had never been before the war, since supplies of German dyestuffs were no longer available to the British textile industry. In 1917 more picric acid was made in one day than had been produced in a whole year before the war.The production of picric acid on such a scale was certainly profitable, but the urgent and often frenzied pace with which it was manufactured saw ‘large numbers of new hands employed in doing work of a technical character at very high pressure’, as one report remarked in 1917. Night shifts were the rule, there was often continuous working around the clock, and many of the new and inexperienced workers lacked any sort of training. Although improvements had been made in the level of supervision and the precautions which were taken, all the previous concerns about the safety of picric acid were reawakened once more. An explosion at the Ellison’s picric acid works in Heckmondwike in December 1914 led to the almost universal operation of grinding picric acid in the wet state instead of crushing it dry. But this practice helped to produce picric acid which was much more sensitive because it was purer, finer and drier. Other reasons given for this greater sensitivity were ‘the more stringent modern specification and lower sulphuric acid content’ and the use of synthetic phenol rather than coal-tar phenol. In 1916 the annual report of His Majesty’s Inspectorate of Explosives reported that ‘All the important existing factories have been enormously increased in size and the output of them duplicated several times over’. The general condition of the factories, having regard to the exceptional circumstances now obtaining, is highly satisfactory. We have considerable difficulty, however, in impressing on the picric acid manufacturers the necessity for strict observance of our requirements in regard to cleanliness and freedom from grit in danger buildings. The report pointed to the fact that many picric acid works were difficult to keep clean because they were part of general chemical plants where cleanliness had never been a priority, creating a ‘slackness’ on the part of workers transferred to make picric acid. It also noted that there were often excessive quantities of picric acid stored in packing sheds, although it was recognised that this was almost wholly because of ‘circumstances outside the control of the manufacturers’. Nevertheless, 158 men and women were killed that year in accidents in picric acid factories.These accidents accounted for 81 per cent of the total fatalities for the whole of the explosives manufacturing industry in 1916, the worst year of the war for the industry. The annual report lamented the fact that all these fatalities could probably have been prevented if ‘instead of engaging in futile efforts to extinguish the fires, the factory officials concerned had cleared everyone away from the neighbourhood’. This works [Wyke Lane] was somewhat damaged by the explosion.The windows in the drying sheds, and the roof of the magazine were damaged, thus leaving the picric acid and the sieving- machine insufficiently protected from any stray sparks. Little structural damage was done, but the roof of the magazine was unsafe. Because another explosion was expected at Low Moor and the wind was blowing in the direction of the Wyke Lane works, the police wanted to saturate the plant in water for safety reasons. Burton thought this would cause an unnecessary loss of output and persuaded them instead to carry out other precautionary measures to minimise the risk of an explosion on the site. So the drying shed windows were boarded up, the picric acid bins in the magazine were covered up with empty boxes, and a wagon sheet was stretched across the broken window in the magazine roof. The explosion revealed that the Low Moor Company had contravened both its licence and the Explosives Act. In the sifting and packing shed where the main explosion occurred, more than twice as much acid was stored than was permitted. Drums of picric acid stood uncovered around the site and were stacked in a way which made the starting lever for the drenching apparatus within the building inaccessible. Overshoes, designed to prevent the introduction of grit and other foreign substances which might combine with the acid to form picrates, were generally neglected by the workforce. The explosives inspector believed that ‘had the discipline in the factory been of a higher order the catastrophe would not have occurred’. Most of the deaths occurred because the works was not cleared at once after the fire had started and many employees were still on the site at the time of the explosion. The lesson learned from the Low Moor explosion was that all dry picric acid operations should be segregated from the nitrating and wet operations.This was partly the reason for the new buildings erected on the south side of Breaks’s works, which were nearing completion in early 1917. They were intended for the drying, sieving and packing of picric acid while existing buildings were to be used only for the wet processes involved in making the acid.They were also to incorporate the latest drenching apparatus, including automatic sprinklers. Only frost and poor weather had prevented the buildings from already being completed and occupied. 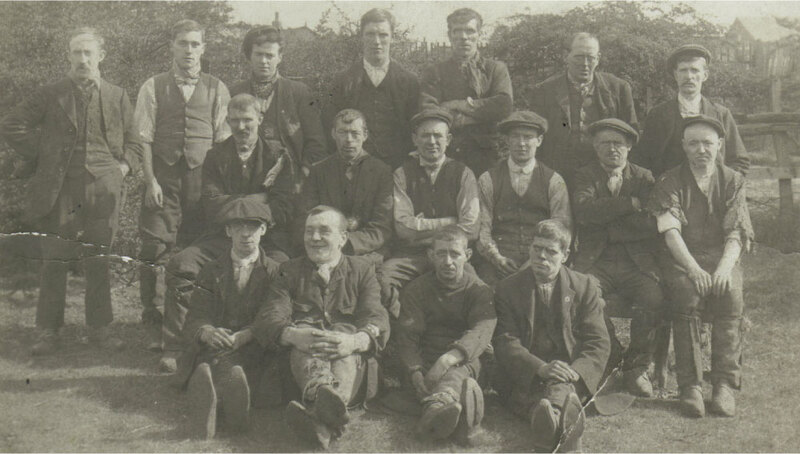 13 February 1917 was a quiet Sunday morning at the Wyke Lane works. All told that morning, the works contained nearly 32,000 pounds of dry picric acid and almost 33,000 pounds of wet picric acid.At about 6:35 am a fire started in the picric acid drying room or stove, containing 1,450 pounds of dry picric acid spread out on the glass drying tables. For some reason the drenching apparatus was not turned on either in the drying room or elsewhere in the factory. John Catherall, one of the workers, saw the fire start with a blue flash like lightning. Having failed to stamp out the blaze with his feet, he tore off his canvas sacking apron and attempted to smother the flames. Another man, Kemp, dashed in with a bucket of water and threw it over the fire but it was too late.The fire was now out of control.The two men ran as fast as they could out of the factory, shouting ‘Fire, run!’ at the top of their voices. Neither of them had thought to turn on the valve for the drenchers nor was anyone else on the site detailed to do so.The first explosion occurred at 6:40 am as both men were running past the laboratory. It was not a violent one since most of the acid had already burned away. Frances Watson had also seen the flames and, shouting ‘Clear, the place is going!’, ran into the yard, before turning back and, with a man named Turner Haigh, helping a disabled worker, Willie Smith, to flee the works. All 50 workers on the site that morning escaped without a single injury.The flames spread rapidly along the woodwork of the roofs and through the empty boxes in the adjacent storeroom to the packing room which contained 19,000 pounds of picric acid in closed boxes. From HM Inspectors Report to Rt.Hon.Sec. of State for Home Dept 13 February 1917. All areas highlighted yellow were completely destroyed. It was only licensed to contain 2,000 pounds but this regulation was often ignored at picric acid works because of the pressure of demand during wartime.At a quarter to seven a second explosion occurred which was so great that it destroyed almost all the buildings on the site. It reduced the boiler house with its sixty feet high chimney to a heap of rubble.The roofs of the three new drying rooms nearly 200 yards away were blown off and the windows and frames blown out. No building was left untouched and many were left with just part of their walls still standing. Some hundred yards outside the site six cottages were so seriously damaged that they had to be rebuilt. Slates were blown off the roof of a farm-house 400 yards away and many other buildings in a similar area suffered similar damage.Windows were shattered in houses in Wyke Lane, Huddersfield Road, and Wyke itself.The force of the explosion was so great that it blew out windows in houses in Lightcliffe, Brighouse, Halifax, Queensbury and Bradford, as far away as five miles from the site.The oval crater left behind by the second explosion measured 23.5 yards by 19 yards and varied in depth below ground level from three and a half feet to eight feet.A third smaller explosion occurred at 8:30 am among the debris of the drying room and the picric acid making room. Although 22 people were injured, remarkably there were no deaths. Not one of those injured was employed at the works; they were all inhabitants of Wyke, of whom three were detained in hospital – Mary Jane Taylor fractured a leg, Frederick Firth incurred a head injury and Arthur Shaw suffered from shock. The other 19 suffered nothing more than minor cuts and wounds caused by broken glass and falling debris. 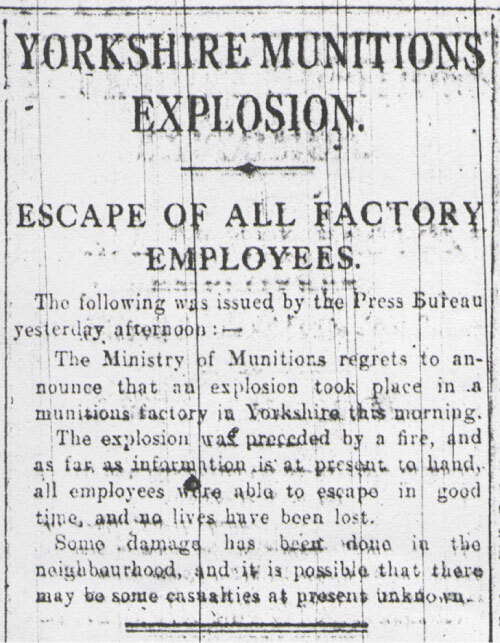 As the inspector reported, ‘Although the main explosion was a very serious one, it is satisfactory to note that all the workers escaped from the factory and no one was fatally injured’. 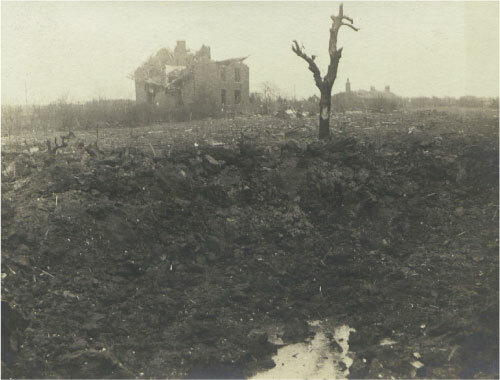 The Wyke Lane site after the explosion of February 1917. The speedy evacuation of the Wyke Lane works was one lesson learned from the Low Moor explosion. Following on so soon after the Low Moor disaster, the Wyke Lane explosion had a sobering effect on the local neighbourhood.The log book at the Low Moor Church of England School recorded on 19 February that ‘Another explosion at a munitions works in the district has caused many people to leave the district again’. It was ironic that in the same week the Wyke Lane explosion caused so much damage, compensation was received by those who had suffered losses caused by the Low Moor accident. 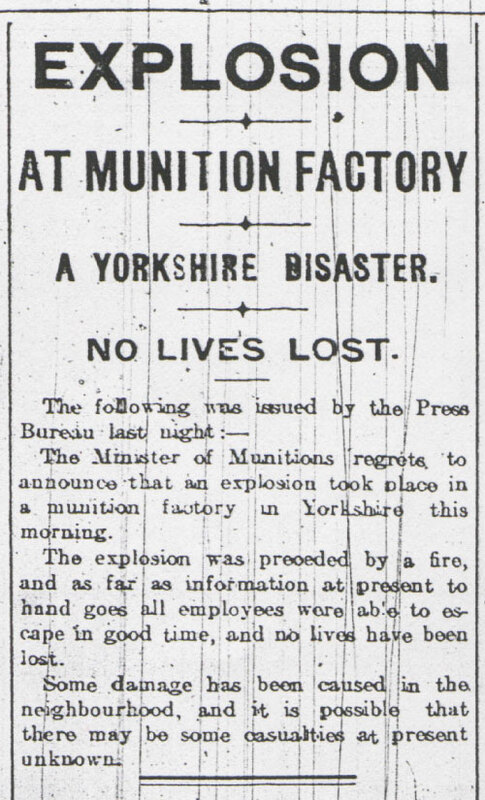 But there was little coverage in the local press because of wartime reporting restrictions.The only reference in the Bradford papers came in the form of a terse announcement issued by the Ministry of Munitions that an explosion had occurred at an unidentified Yorkshire munitions factory but that no lives had been lost. Newspaper articles about the explosion. The packing room was a little distance from the store, but connected to it by a roofed-in space in which there were empty boxes, so that the fire could spread to it without difficulty. But the interval of time was short and it would appear that the picric acid in the drying room must have exploded very shortly after the fire reached it, and in fact not to have suffered the preliminary burning to any great extent before it exploded. 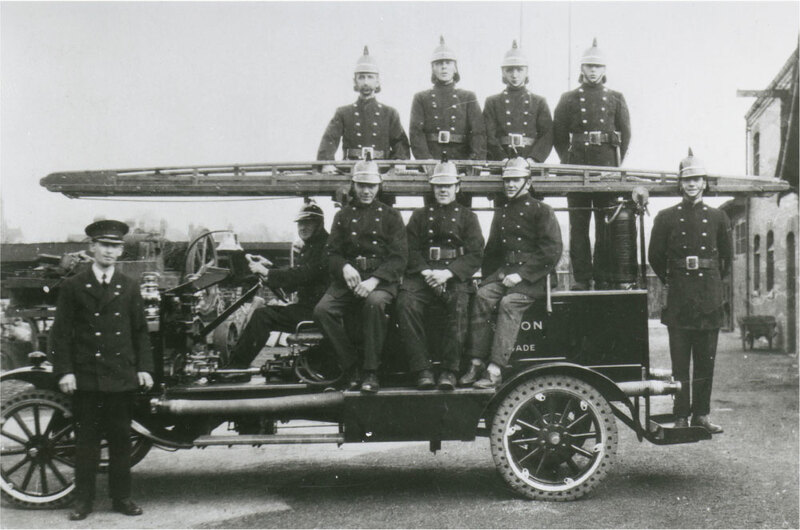 City of Bradford Fire Brigade Department particulars of fire - 13 February 1917. 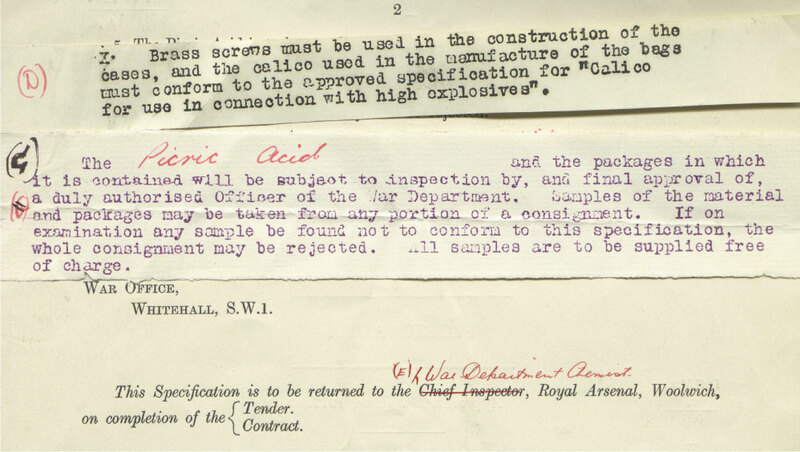 As a result of the Wyke Lane explosion, the exemption under the 1875 Explosives Act of quantities of dry picric acid of 2,000 pounds or less was removed in June 1917. The inspector also recommended that government magazines should be provided in each picric acid manufacturing district; that where there was insufficient safe storage space for the acid on the premises, it should be stored as far away as possible from other buildings; that men should be trained in and given responsibility for the operation of the drenching apparatus; and that more attention should be paid to ensuring that the drying rooms, with their steam pipes, should be kept free of any surplus picric acid. The explosion effectively brought an end to the wartime manufacturing of picric acid at Wyke Lane. But it was not the end of the disasters which plagued picric acid makers during 1916 and 1917. On 27 April 1917, one person was killed and four injured in an accident at the Cote Chemical Company. One week later, on 5 May, another person was killed and 13 were injured when a small quantity of picric acid escaped from a concentration plant at Factory No 290 and exploded. Two further serious accidents took place on the same day, 22 December 1917. An explosion at the Copley works of Sharp & Mallett killed two people and injured three. At Factory No 266, an explosion in an acid concentration plant dealing with waste acids containing picric acid resulted in five deaths. Lessons were learned and during 1918 there were only two reported incidents involving picric acid and neither of them involved any fatalities or injuries. The explosion at Wyke Lane marked the symbolic end of S Breaks & Son Ltd. Four months later the name of the business was changed to A H Marks and Company Limited to reflect more accurately its true ownership.While the business had been in existence for 30 years or more, it now had to start all over again. 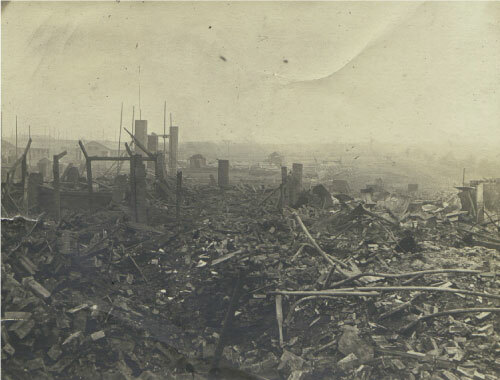 Surviving photographs show a scene of complete devastation at the works, with shattered buildings, the twisted remnants of trees, and a mass of rubble amongst a sea of mud and water. It was a disheartening prospect. Augustus Henry Marks had every intention of raising the phoenix from the ashes. S Breaks) - Green Mount,Wyke.